Other Products by GAT. Search other Pre-Workouts products. 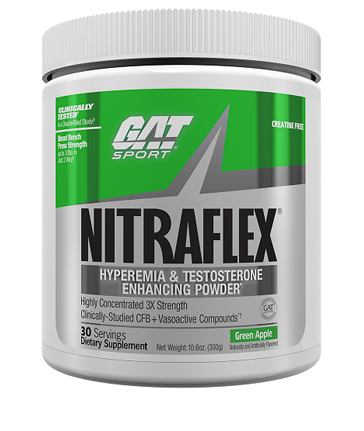 GAT Nitraflex is not only a potent pre-workout but a hyperemaia and testosterone boosting powder. Meaning not only will you get the usual energy and focus a pre-workout delivers you will also have increased blood flow to the tissues including the muscle ensuring alll the nutrients are delivered at a rapid rate for an uprecedented workout. Not only will GAT Nitraflex produce massive muslce pumps it will increase testosterone levels providing a significant increase in strength that you can feel. Nitraflex utilises a key ingredient calcium fructopyranose borate (CFB) shown to boost testosterone levels within 3hours of a single dose. Nitraflex was tested in a double blind pilot study using subjects with 3-5 years experience in resistance training. Nitraflex was shown to increase strength, stamina and testosterone levels after just 2 weeks at a 1 scoop serving. All subjects increased their bench press weights by 2.3 - 5.5kg and all subjects increase their muscle work capacity (muscular endurance). Nitraflex was not only designed to improve your improve your workout performance it has been PROVEN to increase your performance and workout intensity. 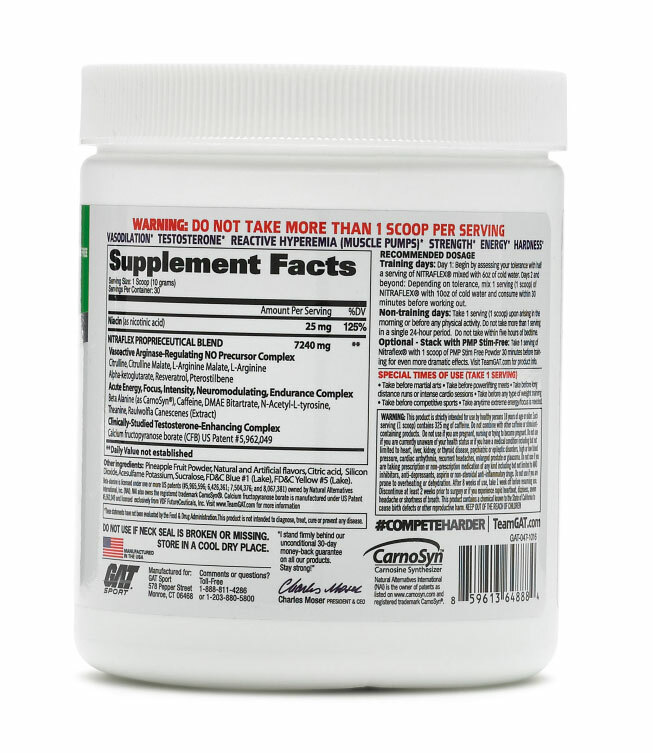 Optional - Stack with PMP Stim-Free: Take 1 serving of Nitraflex® with 1 scoop of PMP Stim Free Powder 30 minutes before training for even more dramatic effects. VASOACTIVE ARGINASE-REGULARTING NO PRECURSOR COMPLEX: Citrulline, Citrulline Malate, L-Arginine Malate, L-Arginine Alpha Ketoglutarate, Resveratrol, Pterostilbene. ACUTE ENERGY, FOCUS, INTENSITY, NEUROMODULATING, ENDURANCE COMPLEX: Beta Alanine (CarnoSyn)(1,500mg), Caffeine, DMAE Bitartrate, N-Acetyl-L-Tyrosine, Theaninie, Raulwolfia Canescenes (Extract). OTHER INGREDIENTS: Pineapple Fruit Powder, Citric Acid, Silicon Dioxide, Acesulfame Potassium, Natural and Artificial Flavours, Sucralose, FD&C Red #40, FD&C Blue #1.